We know of no occupant of this house prior to Daniel May Esq. who bought the manor from the Earl of Abingdon early in the 18th century. Daniel built the house shortly before his marriage in 1744. The survey of his Manor House and Farme is dated 1748 and the house is drawn (perhaps only from the surveyor’s imagination) as a red square house with side wings, the centre square-turreted at each side. In front of it extends a long square garden; and this makes me think the rest may be exact as it then was, for, in dry weather, I can trace a ridge, each side, running down the Park as though a wall had enclosed a square space in front of the house. There was an old pond to it and, even now, one can see where it was, for, after wet weather, water lies at the spot and, when dry, a round sunken space is easily seen. The garden was 2 acres and 16 pole, the house and courts, 1 acre and 5 pole, so perhaps it had a courtyard like Calcot. A ha-ha divided it from the farm buildings and this is now arched over and crosses under the lawn, beginning the farther side of the laurestinus bush and extending nearly to the stable yard. In 1800, William Thoyts rebuilt the house, making it very much what it is now. In 1851-2, Mortimer George Thoyts added rooms on the south side over the door where flat beads were, and built the conservatory and raised the portico in front. He pulled down the old farm buildings and turned the old timber yard into, what is now, the south shubbery. He raised the portico of the house to over, instead of under, the first floor windows; built out the upper rooms on the south side on, what were then, flat beads; turned the library (an old fashioned room, each recess filled with cupboards with brass fronts and red silk) into the present dining room; broke through the wall of the old dining room and made the folding doors; and, instead of the old fashioned sloping greenhouse, built the conservatory. Lady Wynford says, in her youth, the north side had a sloping grass terrace (where the raised gravel terrace now is) and that the Lilies of the Valley grew on the grass in great beauty. A carriage drive was there, as in Mr. May’s day, and a circular sweep on the south side, where grew a large sycamore and several limes. In 1804, the tithe books give the acreage of the house and gardens as 12 pole with a 4 pole forecourt. Total, 16 pole. A well in the backyard had a depth of 175ft from water down to the chalk. There was also a large soft water tank, the roof of which fell in, in 1884. The gas house was built in 1867 and the whole house, stables and cellars lit by the same. The pond by the Theale Lodge within the Park was made in 1856. The Drive on the Jack’s Booth side formerly descended by a steep hill into the lower lane and the one storey cottage there was the lodge. It was altered in the 19th century. Before that, there was another road running out between Higgs Cottage and the brewery, and another by the cottage halfway along the lane. In the 2nd garden, opposite the greenhouses, is an old pump, the head of the cistern of which bears a rose, the initials W.T. and the date 1797, so it, probably, was cast at their foundry. There are, within the house, now: a large hall, double drawing rooms, dining room, business or smoking room and Major Thoyts’ dressing room. Upstairs: 8 best rooms and 5 dressing or smaller rooms, 2 servants’ rooms and a laundry. Top storey: 6 rooms, offices, kitchen, scullery and pantries, housekeeper’s room, storeroom, housemaid’s pantries, servants’ hall, pantry, butler’s pantry, three menservants’ rooms; and outside: larders, dairy, old brewhouse, wash house, ovens and the like. The cellarage extends under the house, except the drawing rooms. Beneath the hall is an old kitchen. The laundry was used up to 1873, when it was removed to a cottage, as the steam penetrated all over the house. The cottage is let to tenants (the big mangle is ours) and they do our washing only, a fair price being charged for each thing washed. Over the stables are 5 rooms, a pantry and 2 corridors where boxes and the like are kept. 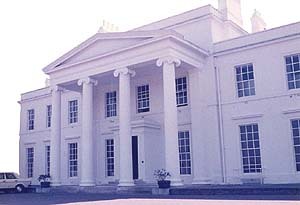 Sulhamstead House was the childhood home of the author, Emma Elizabeth Thoyts.